4 Bedroom Terraced House For Sale in for Guide Price £775,000. 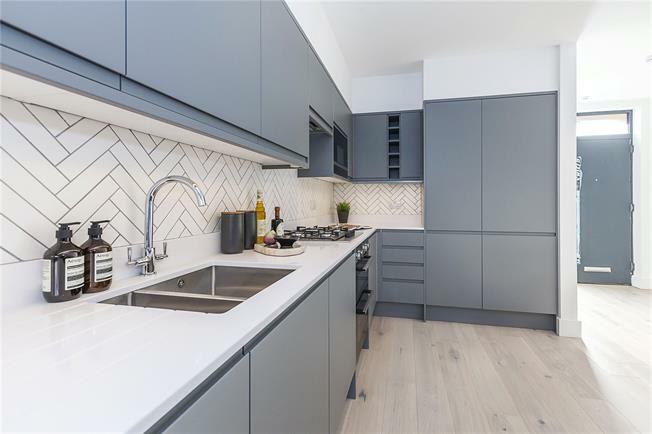 This four bedroom townhouse is one of nine within this secluded development ideally located in the Hatcham Park Conservation Area within the thriving area of New Cross. Contact Hamptons to book a viewing. Now launched, each house has been carefully configured with a modern, open-plan living room/kitchen on the ground floor giving access to a private landscaped garden. Master bedrooms come with an en-suite and fitted wardrobes, with further family bathrooms. The contemporary development is a short walk away from New Cross Gate (Zone 2) which provides quick journeys into Canary Wharf, the city of London via Cannon Street, and central and west London via London Bridge. The Bakerloo Line Extension proposed for New Cross Gate will further improve access to West London. The area is served by a number of high quality primary and secondary schools, as well as Goldsmith’s University which is only 10 minutes’ walk away.